Animal Defenders International : Animal rescues : Rescue mission launched to save circus animals! 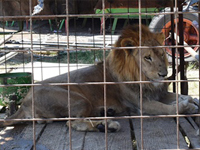 GreaterGood.org unites with Animal Defenders International to launch mission to rescue caged lions in Guatemala. GreaterGood.org, a non-profit leader promoting the health and well-being of people, pets, and the planet, has launched a worldwide appeal to help Animal Defenders International (ADI) rescue animals currently languishing in circus cages in Guatemala. In April, Guatemala’s ban on the use of animals in circuses came into force. The circuses were given 12 months to relocate their animals, but at least 18 lions and tigers remain in the circus cages. One final circus with around 32 tigers is fighting to keep their animals; they attempted to leave Guatemala, but were prevented by the circus animal bans in neighbouring countries (Mexico and El Salvador). This weekend, ADI Colombia’s Yani Mateus relocated to Guatemala for the coming months to co-ordinate ADI’s food relief efforts, construction of holding units, and ongoing efforts to secure the rest of the animals with government officials and locals working together to help the animals. The Guatemalan government, which banned animals in circuses, has provided initial emergency relief and designated Antigua Exotic (a reptile and amphibian rescue centre) as a temporary holding centre for the animals. New facilities to hold the cats need to be built there. ADI will be working with them to help the animals. A number of US tiger sanctuaries have offered permanent homes for the tigers. ADI has rescued and relocated hundreds of animals around the world, including over 60 lions and tigers from circuses in Latin America. In Bolivia and Peru, ADI worked with government officials and police to track down and raid every circus and rescue all of the animals. The five lions that ADI has initially committed to taking will be going to a new sanctuary ADI is building in South Africa, the natural homeland of many wild animals used in circuses. Funds raised by the Seattle-based GreaterGood.org will go toward temporary accommodation for the big cats, feeding and caring for them, their relocation, and the huge enclosures in Africa, where the lucky cats will live out the rest of their lives. With this latest collaboration, both parties hope to repeat the success of their previous partnerships. In 2016, GreaterGood.org teamed up with ADI to raise over $220,000 (£160,000+) to help 33 ex-circus lions get home to Africa from South America. Donations to help save the neglected circus big cats in Guatemala can be made on the dedicated GreaterGood.org fundraising page.